Winner of Best of Class and Best of Division at the world famous Santa Fe Indian Market, Watson Honanie is the acclaimed innovator of gold overlay jewelry. 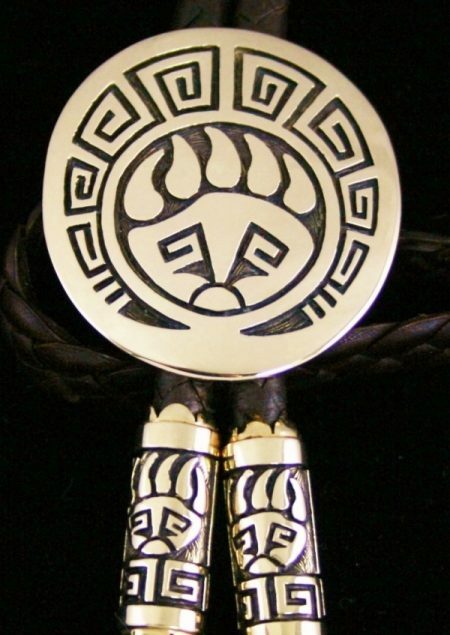 His jewelry depicts tribal clans, Hopi villages, ceremonial dancers, and petroglyph images. 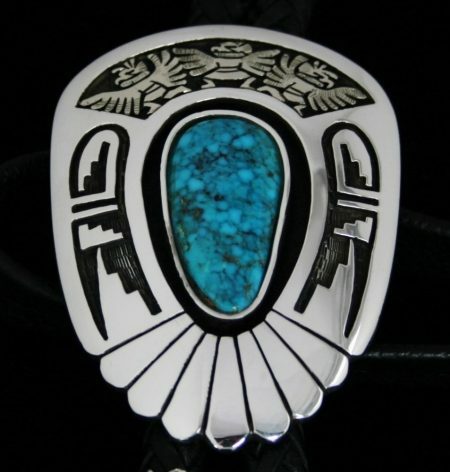 He often incorporates gold, diamonds and gem grade turquoise in his pieces. Watson’s mentor was his uncle, Fred Kabotie, manager of the Hopi Art and Crafts Guild. Watson’s work is in the finest galleries in the country. Hopi jeweler Watson Honanie has created this beautiful bracelet by overlaying solid 14k gold onto sterling silver, a technique mastered only by the finest jewelers. He has cut out the hands of time and the turtle, the one who carries the weight of the world on its back to place in the middle of the band. Between these symbols, the bear who brought the people to their ancient mesa villages, buffalo and elk are gloriously exhibited on a deeply oxidized and etched background. 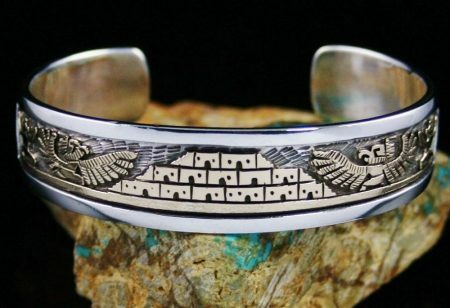 Hopi jeweler Watson Honanie has created this beautiful bracelet out of heavy gauge sterling silver. He has cut out five turtles symbolizing the guide who brought the Hopi to their desert mesa home. The center turtle, made with solid 14K gold, is the central focus of the piece. 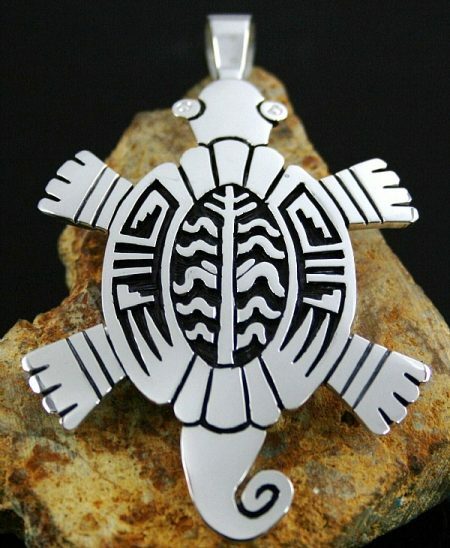 Each turtle carries on his back a symbol of fertility, growth and abundance. These symbols are the corn stalk, sun, rain, clouds and storm. 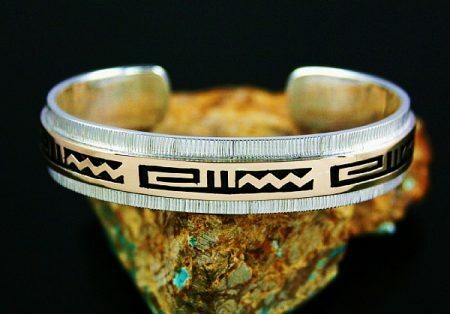 This incredible bracelet was hand made by Hopi goldsmith Watson Honanie. 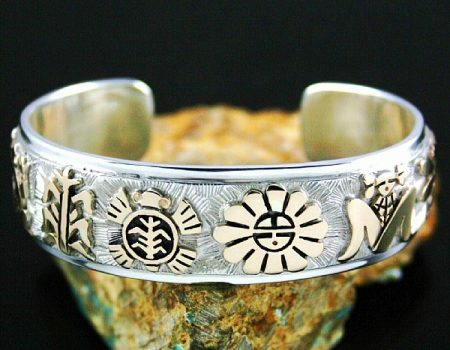 The piece was created by sand casting a heavy bracelet shank out of sterling silver and overlaying mythic creatures from Hopi life. The figures are expertly hand cut out of solid 14K gold. The symbols include the reindeer, the hands of time, the frog in the water, turtle, sun god, corn maiden within the husk, dragonfly, kokopelli and spider. All of these symbolize fertility, growth and abundance, concepts so important to people of the desert. 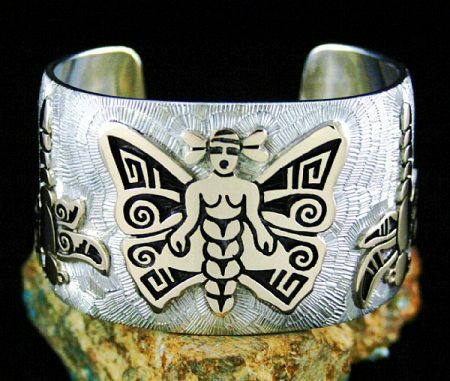 Hopi master goldsmith Watson Honanie has created this mythical bracelet by using heavy fourteen gauge sterling silver and precisely etching the complete surface. He then cuts out his vision of butterflies and dragonflies in solid 14K gold and overlays them on the shank. The figures represent clans within the tribe with the butterfly maiden in the center. The figures are expertly oxidized for affect. The finished piece is one of Watson's great masterpieces. 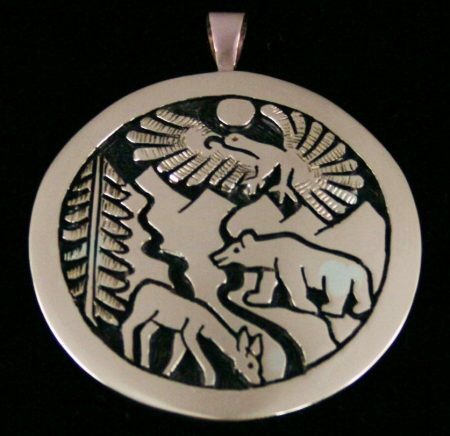 Hopi jeweler Watson Honanie has created this wonderful sterling silver pendant using the motif of the turtle clan. The turtle led the people from the underworld to the mesas of northern Arizona in the Hopi creation story. The corn stock on his back symbolizes growth and abundance. 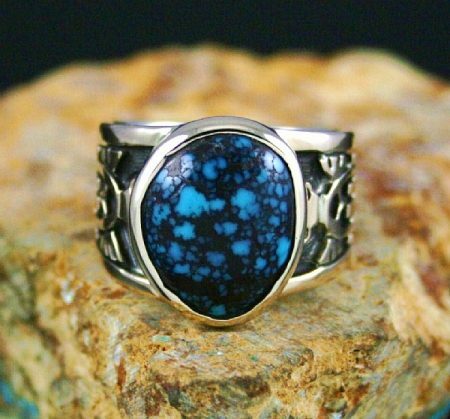 Hopi master goldsmith Watson Honanie created this solid 18K gold over sterling silver ring by selecting a magnificent rare gem grade natural Lander Blue spiderweb cabochon from Nevada to set in the piece. This turquoise is widely acknowledged as the world's rarest and most valuable. There is a total of 6.85 carats of turquoise in this ring. The gem is deep blue with tight black spiderweb matrix that is a classic representation from this famous but now depleted mine. 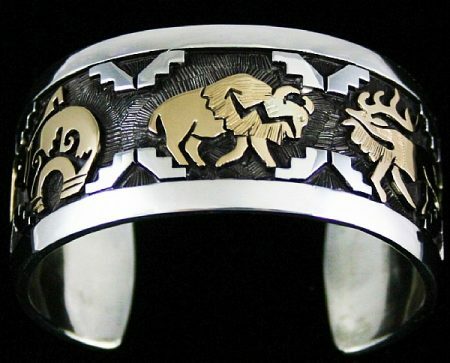 Watson has embellished the sides of the ring shank with fine overlayed turtles, symbols of the guides who led the Hopi from the lower world to the mesas surrounding their homeland. Water designs in waves are elegantly displayed on the underside of the band as well and are the symbol of the source of all life. 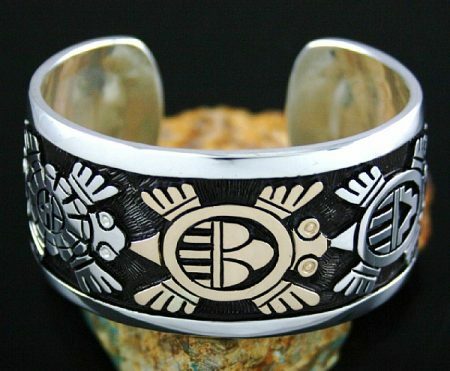 Hopi master overlay jeweler Watson Honanie has created this heavy two inch bracelet by overlaying two sheets of sterling silver. The design is so complex that it could have only been made by the finest of silversmiths. Simple and elegant, the bracelet makes a powerful statement on the wrist. Created by the hands of master Hopi goldsmith, Watson Honanie, this magnificent piece is of the finest collector quality. Five solid 14K gold bear profiles are overlayed in the center of the piece. The bears symbolize protection, guidance and physical strength. The protectors of the people, the bears are known to hunt in any weather no matter how harsh. The heartlines symbolize bravery and truth under all conditions. Brought out with hand etched detail this fabulous one of a kind piece is a superb example of Watson's ability in creating timeless items of beauty. 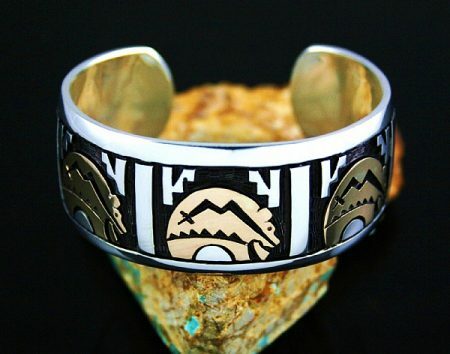 Clouds, weather and rain designs are the symbolic themes of this marvelous solid 14K gold over sterling silver bracelet created by award winning Hopi artist, Watson Honanie. The gold accents and heavy gauge sterling silver give the piece a significant weight and feel. The gold is offset and raised to show off the beauty of the design with hand etched detail on the outer edges. 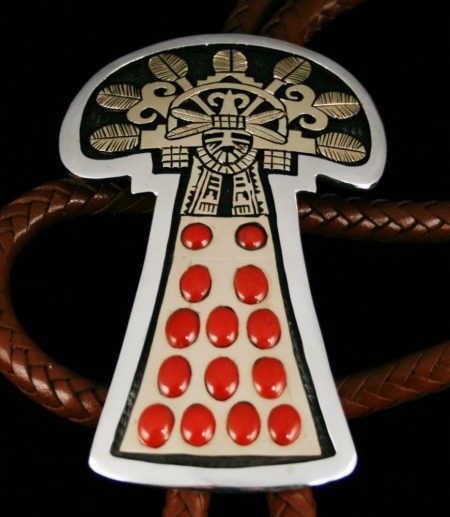 Hand made by one of the most famous and talented silver and goldsmiths in Indian Country, this magnificent bolo tie is the work of award winning Hopi artist, Watson Honanie. The piece features turquoise from the famous and now depleted Lander Blue mine in Nevada. Highly prized as the most valuable turquoise in the world the cabochon is an exquisite deep blue with tight dark chocolate-brown spiderweb matrix. A separate certificate of authenticity will be provided by the mine owner himself. This marvelous stone is further complimented by the beauty of Watson's labor intensive work in solid 18K gold over sterling silver. 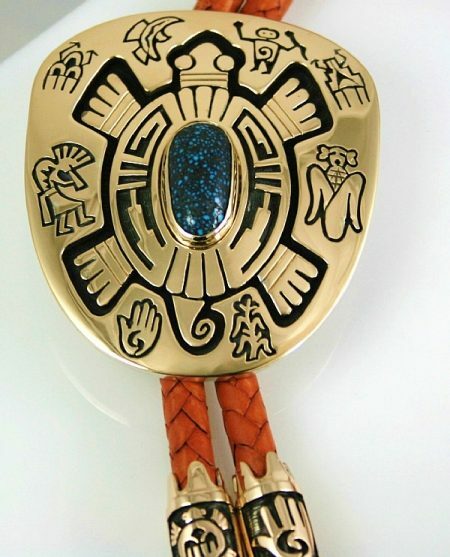 Masterful petroglyph symbols were hand etched and encircle the sacred turtle design in the piece. The petroglyphs represent each of the clans in the Hopi religion including, corn, water, sand and deer. The turtle symbolizes the life bearing animal who carries the weight of the world on it's back. Both the sliders and tips on the bolo tie are solid 18K gold with precise detail and design as well. 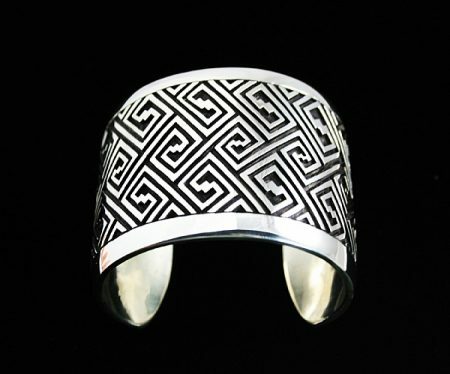 This masterpiece overlay cuff was created by award winning Hopi artist, Watson Honanie. The technique of making a bracelet of this quality is extremely labor intensive. With a tremendous amount of skill and precision, the artist cut out exquisite geometric patterns in heavy gauge sterling silver with a darkened background. This piece is eye-dazzling in every way. 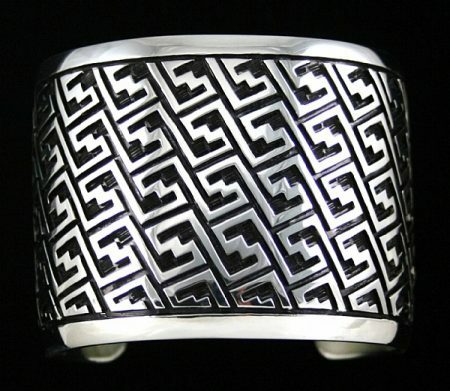 It is sophisticated, precise and contemporary, yet it hearkens back to some of the classic Hopi silver work. Watson is very famous for his innovated time consuming creations and this piece is truly exceptional. 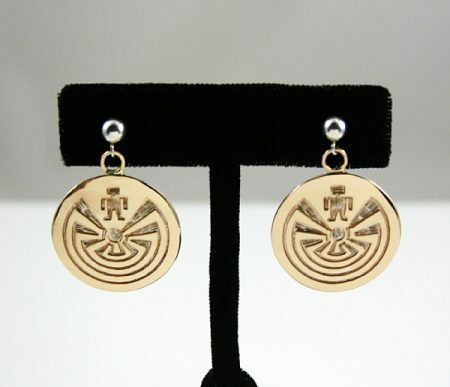 These spectacular dangle earrings created by award winning Hopi artist, Watson Honanie, display a beautiful man in the maze design in solid 14K gold over sterling silver. Legend has it that the maze represents choices and experiences that we make in our journey through life. In the middle of the maze a person will find their goals and dreams. When that person reaches the center, they will have one last chance to look back upon their path and choices before the sun god greets them blesses them and passes them into the next world. 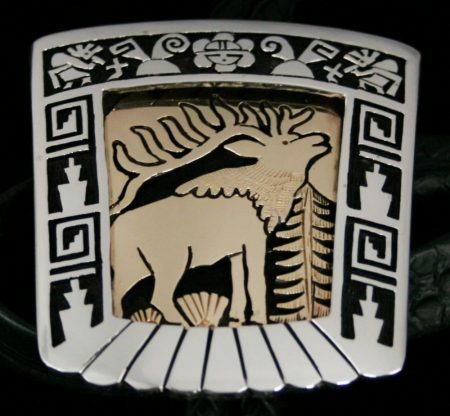 This lovely one of a kind ring was hand made by award winning Hopi artist, Watson Honanie. 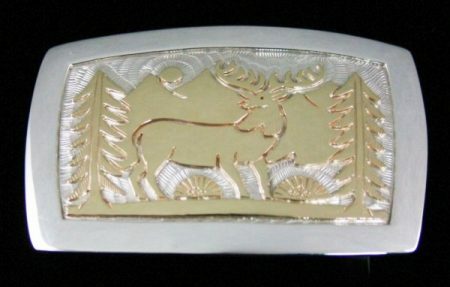 The piece includes elaborate detail and design in solid 14K gold over sterling silver with an outstanding wilderness scene. A bear for protection and guidance is displayed in the center accompanied by an elk and ram on either side. The artist included a beautiful sun design rising up behind the mountains and pine trees adding a very special touch to the piece as well. 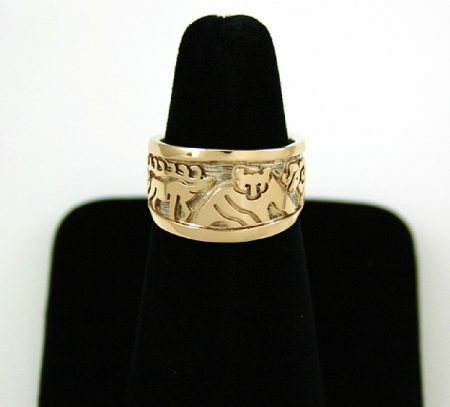 The animal profiles are brought out with hand etched detail in sterling silver with a smooth solid 14K gold trim on the outer edges of the band.